I can’t remember the last time Arsenal bought three established world-class players in one transfer window, no less outside of the dying hours of the window (Arshavin anyone?). It’s certainly a relief to have most of our business out of the way unlike last season when the club made a mad scramble for replacements hours before the deadline on September 1st. It seemed that the club has learnt from mistakes made last summer. They were looking to strengthen the squad ahead of potential departures (Edit: Sayonara RvP. Enjoy your new dull life in Manchester). Despite the fact that our signings this summer have not incited the usual “WHO?” from most Arsenal supporters, this will still be the first time many of us will be watching them play on a regular basis since none of them have ever played outside of their home country. I thought it would be helpful to ask those who are more familiar with their careers in the last few years about how they think our new signings will fit into life at Arsenal and England. Lukas Podolski joined the club soon after the 2011-2012 season ended. The German international has scored 44 goals for his country to date, amassing over 100 appearances in the process. He’s the youngest ever player to reach the 100 milestone for Germany at the age of 26. The striker, who is affectionately referred to as ‘Prinz Poldi’ by German fans, was named Best Young Player ahead of Lionel Messi and Cristiano Ronaldo in the 2006 World Cup. Despite making a name for himself on the international stage, Podolski has not been as impressive on the domestic front. Many would not have blamed Poldi for leaving Cologne for greener pastures after his hometown club was relegated at the end of the 2003-2004 season but he stuck around and helped the club in its promotion to the first division a year later by scoring 24 goals. When Bayern managed to secure his signature ahead of Liverpool and Real Madrid in 2006, they had high hopes for the rising star of German football. However, he failed to impress, and requested to leave in 2008 after being unable to hold down a starting position at the Bavarian club. Cologne’s fans raised some of the money to bring home their son the following summer. Podolski’s second stint at the Rhine club got off to a slow start but really took off last season when he scored 18 goals in 29 league appearances as Cologne battled relegation unsuccessfully. He was playing the best football of his life according to many German football analysts and looked ready to take the next step in his career. Germany coach Joachim Low said “He’s ready for a move abroad now” in February. Today, I’ll be joined by Chris of @GermanGunners (site and twitter) who will provide us with insight on Podolski and how he thinks the German forward is an excellent signing for Arsenal. 1. 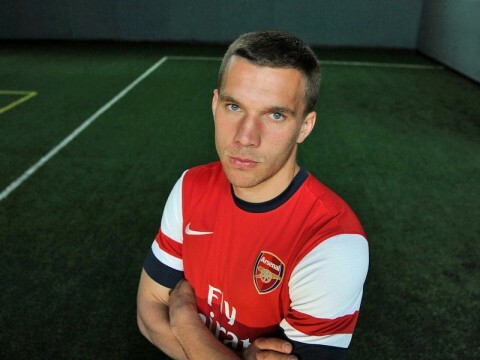 What was your initial reaction when you heard Podolski was joining Arsenal? My initial thought was, finally good striker who can take the goal burden of RVP. 2. How much of an impact do you think his departure will have on Cologne? The impact will be and already is massive. He was their best player all year long. But even he couldn’t prevent relegation. Cologne had to sell all their experienced players and switch to a youth system for this season. They had a bad start to the new campaign with only one point out of six. So the upcoming season will be very hard for them without these important Poldi goals. 3. What are the strengths and weaknesses you have observed of Podolski? Both on the pitch and off it. He’s a quick physical striker with a scent finish. He is also a great team player and you can compare his fighting spirit with that of Wilshere or Liverpool’s Gerrard. Off the pitch he is the funniest guy in football I know. He is always good for team spirit. 4. How did Podolski grow as a player while at Cologne and at Bayern? He was bit young when he went to Munich. He learned a lot in his time in Cologne as he had to lead the team and was the main man in Cologne. 5. How do you think Podolski will fit into the Arsenal team? He will play up front possibly on the left flank. He could also sit behind a central striker in the central midfield position. With RVP probably leaving, he will link up with Giroud. 6. How do you see Podolski coping in England and the Premier League? He will have no problems as he is made for the English game. He’s physical and will not be bullied around. 7. Podolski and Per seem to be quite close from their time playing together for Germany. How do you think this relationship will help in Podolski’s adjustment to playing outside of Germany for the first time in his career? It’s always good to have a guy to turn to for problems. They are good mates. But he learned to manage stuff on his own and speaks some proper English. Again, I would like to thank Chris for his contribution to this blog and look out for Parts 2 and 3 on Olivier Giroud and Santi Cazorla in the coming days! I’ll leave you with a snippet of Poldi’s other ‘talent’. Enjoy!